I have been learning the guitar for a few terms now and am getting steadily better at it. I am currently learning Ode to Joy by Beethoven. I have a really good guitarist who teaches me. 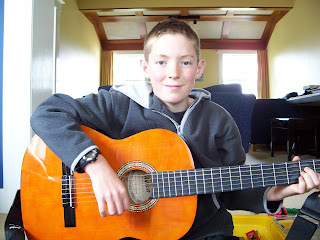 You should hear him play, when he plays the guitar it sounds so beautiful, simply marvellous. Doesn't A2 look cute in this picture that I took this morning. 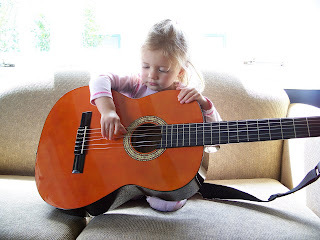 Maybe when she gets a bit bigger, she will be another guitarist!!! The competition on my last post won't close until the end of the holidays.